Welcome to Melbourne’s first Spaghetti Bolognese challenge. The start date is September 1. How is this challenge going to work? I have one year to try at least 52 difference Bolognese dishes. Each week I will post about the Spaghetti Bolognese dishes I have eaten, and will rate them accordingly. After a year of Spaghetti Bolognese taste testing, I will crown one the best in Melbourne. My list of Spaghetti Bolognese eateries is growing, but I still need more recommendations – feel free to suggest places for me to eat. I hear many claim they make the best Spag Bol, so home cooked ones will be included too. Think you make the best? Put yours to the test! 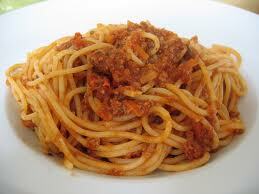 Get in touch with me via spaghetti@blogenese.com or on Twitter @BologneseLover. So, what makes a good Spaghetti Bolognese, you may ask? Many factors. All will be divulged in due course, as well as my judging criteria. Stay tuned Spaghetti Bolognese lovers.